A wreck believed to be a ship from the Spanish Armada, discovered by archaeologists off the coast of County Donegal, is to be excavated by the Irish government. It was found in the summer of 2010 and divers at the time discovered a tunic button and piece of Spanish pottery. Far from home, this wreck is not the first to be found off the coast of Ireland. It's thought that up to 24 ships were wrecked along the north and west coasts of Ireland as the Armada made its way home after defeat at the hands of the English. In the summer of 1588 the Spanish Armada set sail for England after decades of hostility between Spain's catholic King Philip II and the protestant Queen Elizabeth I of England. Once in-laws, when Phillip was married to Elizabeth's elder sister Mary, the Spanish king was determined to overthrow the new Protestant regime in Britain introduced by Henry VIII. It is remembered as one of the greatest naval battles in history, when the British fleet of 66 ships defeated an Armada twice its size by sailing fireships into its formation off Calais. 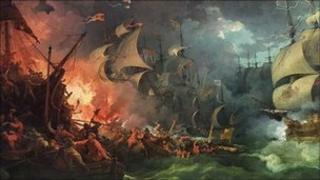 Although relatively few ships were destroyed, the wind forced the Armada fleet into the North Sea. After drifting into the North Sea, unable to return to Spain through the channel, the remainder of the fleet faced a perilous voyage home through the unfamiliar waters and worsening weather around Scotland and Ireland. This latest find was discovered in shallow water near Burtonport. The Irish Department of Arts Heritage and the Gaeltacht has given 50,000 euros of funding for an exploratory excavation of the wreck. Minister Jimmy Deenihan said that he was "delighted" to be able to support investigations into "a major find of significance not only to Ireland but also to the international archaeological, historical and maritime communities". If it proves to be an Armada vessel, the minister said that it could constitute one of the most intact of these wrecks discovered to date. "It could provide huge insight into life on board and the reality of the military and naval resources available to the Armada campaign", he said. The Geological Survey of Ireland will supply one of its research vessels, the RV Keary, free of charge as the main dive vessel.